COPD caregivers are often underprepared for the range of roles and tasks required when tending to a family member or friend with COPD. Empowering caregivers with information and ways to support themselves through the caregiving experience, as well as information to support the care of the person living with COPD, has a positive impact on both caregivers and patients. How do I help the person I’m caring for manage COPD? What should I know about managing a home for someone living with COPD? How do I prepare for a visit to the doctor? How do I help after a COPD flare-up (exacerbation) or hospital stay? How do I take care of myself while managing someone else’s care? The Toolkit is divided into five sections organized to provide education, resources and tools to address each of the above five questions. Each section includes templates and checklists that can be customized by the COPD caregiver, such as “what questions should I be asking the doctor?” and “how and why should I track vaccinations?” Each section includes a pocket folder to allow space for collection of medical documents, such as updated COPD medication lists, medical power of attorney information, hospital discharge plan, etc. It is RHA’s intention that caregivers will not only use the Toolkit as their go-to resource while at home, but also take it with them to medical appointments and ED visits, confident that the Toolkit (with any caregivers contributions) will contain information that will be helpful on their COPD journey. 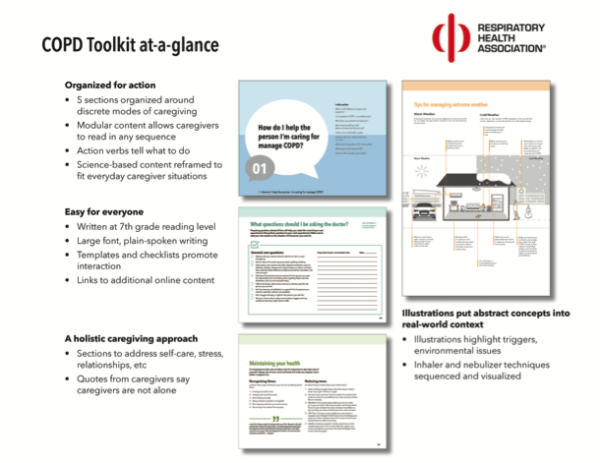 RHA will disseminate approximately 300 copies of The COPD Caregiver’s Toolkit through health care providers in Illinois, Indiana, Michigan, Ohio and Wisconsin. RHA is distributing these educational resources under a subcontract to the National Heart, Lung and Blood Institute’s COPD Learn More Breathe Better® program in an effort to reduce the burden of COPD and improve disease treatment and management.